The three oldest stained glass windows in the building were created in 1924 by Haskins Glass Studio, Rochester, New York. 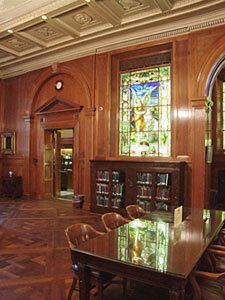 These windows were originally installed in the Browning Room in Carroll Library, once Baylor's main library. Today they are mounted along the inner wall of the John Leddy-Jones Research Hall, and are backlit. All three windows are fine examples of pictorial stained glass. The ten stained glass windows on the outside walls of the room were created by Jacoby Art Glass Company, Saint Louis, Missouri, in a "Munich-style," during the 1948 - 1951 construction of the Library. All of the windows in this room illustrate Robert Browning's poetry. Please take a moment to enjoy their beauty and to study the accompanying poetry. "The Guardian Angel: A Picture at Fano"